Well now. Here’s one that doesn’t get talked about all that much: one of SNK’s earliest games, and a title believed to be the second ever fixed shoot ’em up, after Taito’s genre-defining classic Space Invaders. 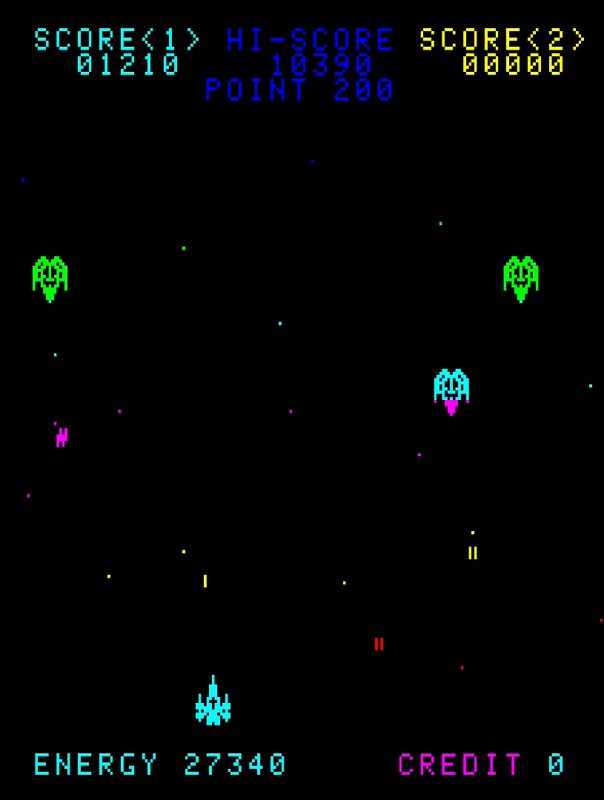 In fact, Ozma Wars, developed by Logitec (no, not that one) and published by SNK in 1979, ran on the same Taito 8080 hardware that powered Space Invaders, was available as a conversion kit for Space Invaders machines, and even made use of the same coloured overlay on its black and white display to bring a bit of vibrancy to the visuals. What’s more, it provides a thoroughly interesting early shoot ’em up experience that is markedly distinct from Taito’s title. Let’s take a closer look. My wife thinks this looks like the mothership has a big ol’ wang. Please indicate if you agree in the comments. It’s immediately clear that something different is going on with Ozma Wars when you start the game and are not immediately thrown into battle. 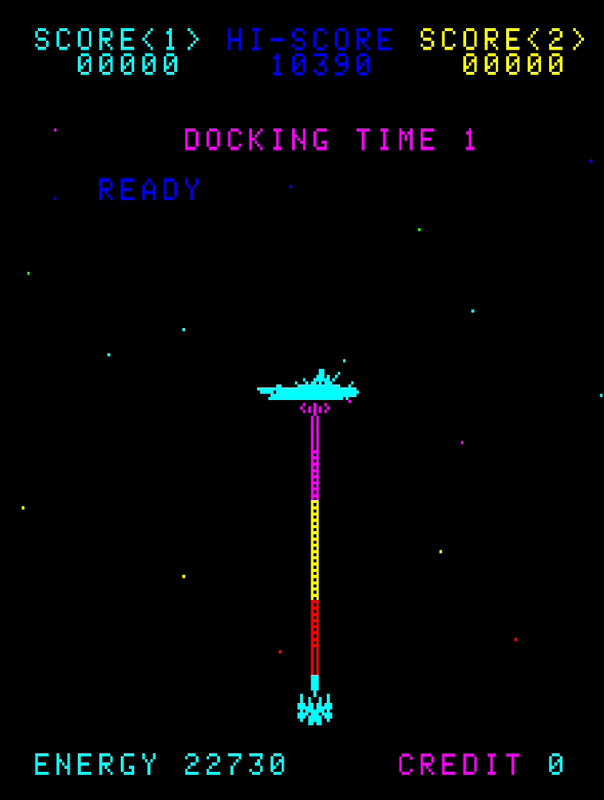 Instead, you’re presented with a “docking” sequence, where a mothership appears and extends a large pipe out towards you. Docking with this fills up a numerical energy meter in the corner of the screen, and after that, it’s on with the fight! 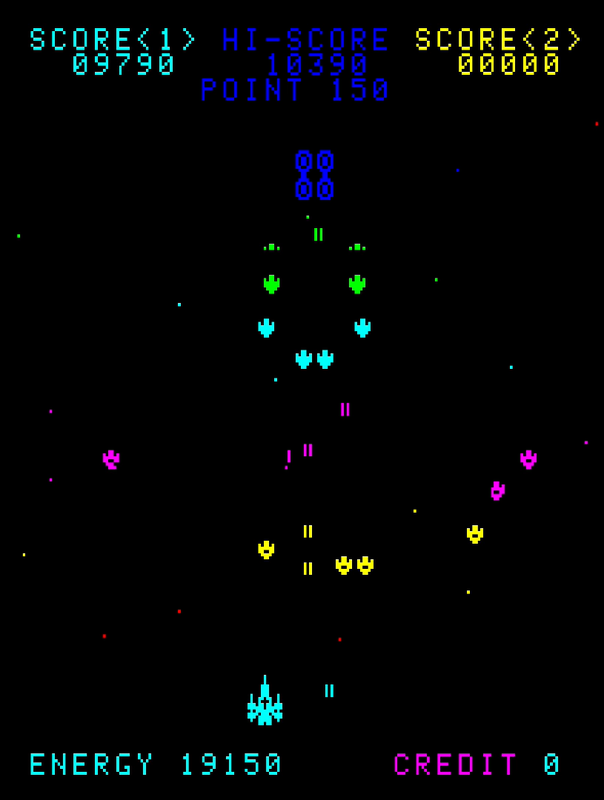 Enemies in Ozma Wars don’t simply parade back and forth waiting to be blasted as in Space Invaders. Instead, they aggressively attack, flinging bullets and missiles as you as they swoop down the screen, aiming to collide with your craft. As you clear out each wave of enemies, a new one will take its place, and of particular note is the fact that each wave not only has its own distinctive attack patterns, it also features a variety of different enemy designs, some of which even simulate a quasi-3D effect by coming “out” of the background to fight you. 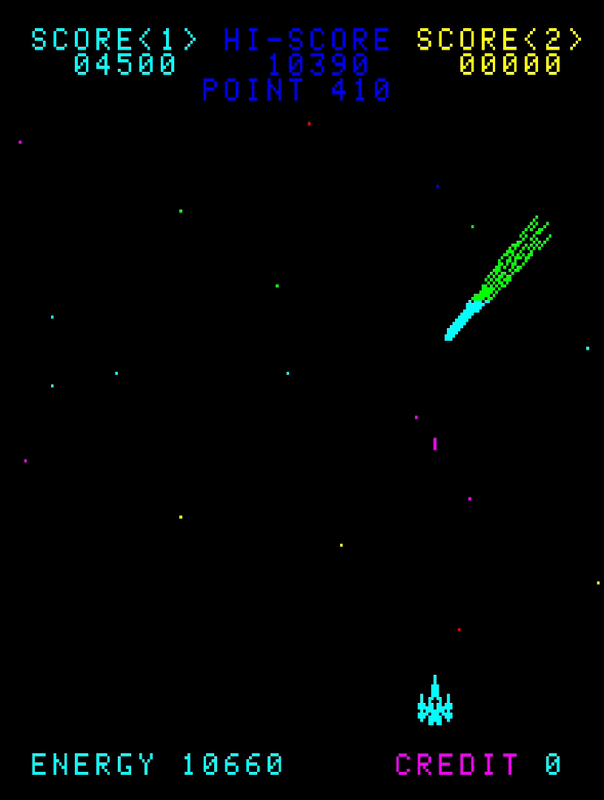 You fight back by firing shots from your ship, which is fixed on its Y-axis at the bottom of the screen. As in Space Invaders, only one shot can be on screen at a time, and you won’t be able to fire again until that shot has either left the screen or disappeared after an impact with an enemy. Consequently, you better aim carefully, otherwise you might find yourself in a difficult situation! The distinction between the missiles and the bullets the enemies fire at you largely concerns whether or not you need to avoid them, or if you can blast them out of the sky. The two are visually distinct — bullets are simple lines, while missiles have a bit of “shape” to them — but it’s easy to get confused when things get hectic. And things get surprisingly hectic during Ozma Wars, with pretty dense barrages of bullets heading your way at times before you thin the enemy ranks a bit. There are a few surprises along the way, too. Blasting a “comet” that appears every few stages isn’t just a straight bonus target challenge as you might expect, for example; instead, successfully hitting it causes it to shower you with bullets and missiles from an escaping enemy, leading to almost certain death if you’re not ready for it. Or does it? Well. Here’s one of Ozma Wars’ most distinctive features: the fact it doesn’t have lives. Instead, you have that numerical energy readout previously mentioned, which gradually declines over time, and which takes a massive hit any time you take damage. In practice, the amount of energy you have and the amount of damage this absorbs roughly equates to the conventional three lives, though the constant drain over time means that later stages are much more dangerous than the earlier ones, since you may well have lost a “life” or two’s worth of energy naturally by the time you get there. Thankfully, the mothership returns at regular intervals for another docking sequence, allowing you to replenish your energy and continue playing, but surviving even to the first of these restock opportunities is no mean feat. It’s a welcome moment of respite when it does occur, however, and a clear “checkpoint” allowing you to track your progress and skills at the game besides the score function. Ozma Wars is a difficult game, but it’s clearly already starting to set the template for later, more complex scrolling shooters rather than simply attempting to ape the standard fixed shooter formula. The enemy patterns that show up with each wave are clearly learnable, and thus success in the game is as much about memorisation as it is about observation, dexterity and accuracy. There’s a surprising number of different enemy waves on offer, too; contrary to what you might expect, the appearance of the mothership isn’t a signal that another “loop” around the same few patterns is starting anew, but rather simply an opportunity to calm down a bit and refocus ready for a renewed assault. Because it never truly ends; despite Ozma Wars clearly setting in place a few conventions that would become standard in more structured scrolling shooters a number of years later, it doesn’t have an “ending”. Instead, like most arcade games of the era, once you’ve seen everything, it simply repeats, challenging you to survive as long as you can against gradually increasing odds. There are a few signs that the genre as a whole still had a few things to learn, though. Although the energy system is effectively an early incarnation of a health bar rather than the more common lives system, its implementation is questionable. Notably, the fact that there is no period of invincibility after being hit means that it’s entirely possible to go from full energy to completely dead with some unfortunate positioning — get hit by one bullet, then immediately get hit by another one before you have time to move out of the way, then get hit by another one and it’s all over. And it happens more frequently than you might expect. The sound effects are absolutely horrendous, too. While the “shot” and “explosion” sound effects are straight out of Space Invaders and are thus fairly inoffensive, the fact that almost the entire game is accompanied by a constant, oscillating whining noise (presumably intended to be the sound of incoming enemy spacecraft) quickly becomes extremely tiresome and will drive both you and everyone around you absolutely bonkers very quickly indeed. Thank heavens for easily accessible volume controls on any modern system you might be playing this game on, then. Ozma Wars didn’t get any official home ports during the early computer and console eras, which is probably the main reason that it’s not as well-known as many of its contemporaries. It’s had a few console ports over the years, though: besides its most recent release as part of the SNK 40th Anniversary Collection, it also had a release under the PlayStation minis cross-platform brand for PS3, Vita and PSP in 2011, a homebrew port to ColecoVision in 2011, and a graphically enhanced version is included as an unlockable secret extra in the 2013 homebrew PC Engine title Revival Chase, itself a spruced-up version of Data East’s 1981 title Lock ‘n’ Chase. How’s that for a convoluted path to (strictly unofficial) release? Is it worth playing today? Sure. Despite not being especially well-known today, Ozma Wars is a game of significant historical interest. 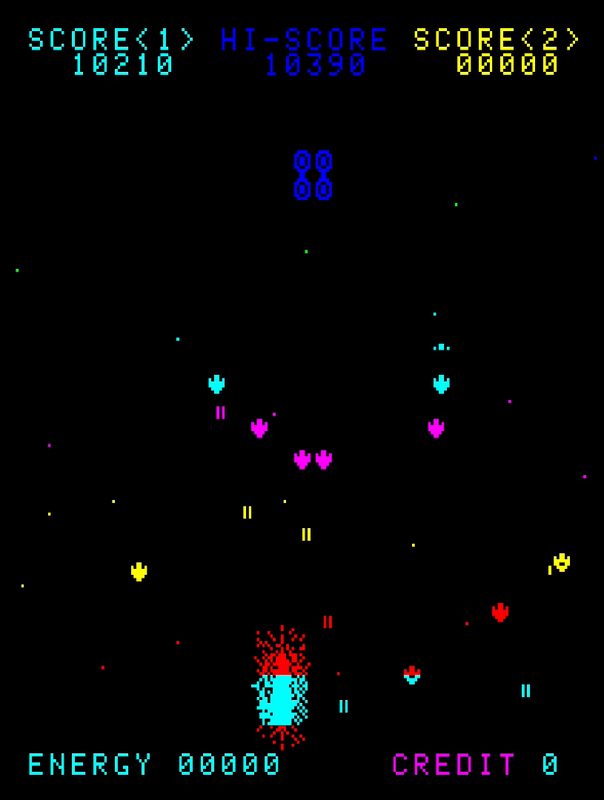 It’s one of the first shoot ’em ups with discrete stages, only the second fixed shooter ever to exist, arguably the first vertically scrolling shoot ’em up with learnable attack patterns, and there are even stages in there that qualify as rudimentary “boss fights”. Sure, its lack of modern conventions and conveniences such as post-damage invincibility and the ability to see exactly how many more hits you can take before Game Over can be a bit annoying, but that doesn’t stop this being an enjoyable, addictive shoot ’em up that is worthy of your respect. I have only vague memories of seeing this game in the wild, and that only because the docking sequence stood out so much. I’d be in real trouble if Klax were to hit Switch. That said, I’d be all over a complete Midway Arcade Treasures set for the platform, but I guess Warner is sitting on all that stuff for… some reason. It’s unfortunate that whatever’s left of Atari (or whoever was responsible for Atari Flashback Classics) wasn’t able to reclaim all the Atari Games stuff, but I guess there’s some sort of complicated legalities going on there. Or just Warner being dicks. Likely the latter.